The Fastest Web Hosting United States Award is presented to the web hosting company that records the best average US page-load speed during our 10-day test period. Of the 50 popular web hosts tested, A2 Hosting compiled an average US page-load speed of only 0.7605 seconds. A2 was the only host tested that was able to record a US average of less than .8 seconds. Further, it is worth noting that this speed was achieved by their lowest-priced hosting plan. All web hosting services reviewed by NCM Online are tested for page-load speed using identical test sites. Testing is conducted by Dotcom Monitor, an independent, third-party testing service. Page-load speed is measured and recorded every 15 minutes for 10 days from 7 US locations: California, Colorado, Florida, Minnesota, New York, Texas, and Virginia. The test results are then compiled and used to produce the page-load speed test results charts and speed ratings that accompany each NCM Online review published. While speed is not the only measure of a great host, at NCM Online, we believe that it reflects a host’s commitment to providing customers with the best available technology. Our testing demonstrates that A2 meets and exceeds this standard. But a great host offers more than just first-rate technology. Other crucial factors include ease of use, resource allocation, support, and of course, price. As winner of NCM Online’s Best Web Hosting 2015 Award, A2 has demonstrated excellence in all aspects of web hosting. 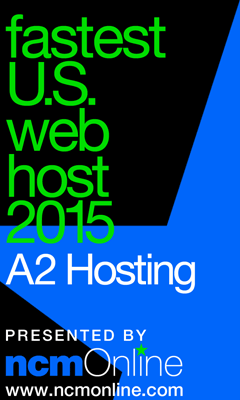 NCM Online is proud to present its Fastest Web Hosting United States Award for 2015 to A2 Hosting.